Easy Product Returns within 30 Days and Secure Shopping for your safety. Find the Fiber Optic cables you need. Use code 5OFF during checkout. Find discounts, industry news, site updates, and more in our blog. Choosing the right cable can be a daunting task for most people. Cables.com makes it easy with and endless stock of cables and wires to suit your professional needs. Featured on this page is our Fiber Optic Mode Conditioning Cables offered at the lowest prices online or elsewhere. No matter what your needs are, you're certain to find exactly what you are looking for in our comprehensive selection of merchandise. 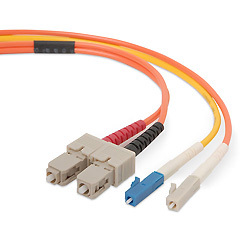 Choose from high performance Fiber Optic Mode Conditioning Cables and wires in a variety of different lengths and sizes. We offer fast shipping and responsive customer service to ensure you get the right equipment delivered on time, and within your budget. Datacomm Cables is a distributor and manufacturer of fiber optic, networking, and ethernet cable and stocks cabinets, racks and patch panels.